The San Leandro Library is partnering with Tech Exchange to hold a Tech Fair and “Appy” Hour at the Main Library. Tech Exchange, a non-profit dedicated to providing digital equity to East Bay residents, employs an environmentally sustainable, re-use model by refurbishing donated computers and providing them to eligible East Bay families, schools and community organizations. Tech Exchange also supports the community with affordable Internet signup, digital skills trainings, and youth internship opportunities. The City of San Leandro recently signed an agreement to donate all its surplus computer equipment to Tech Exchange. 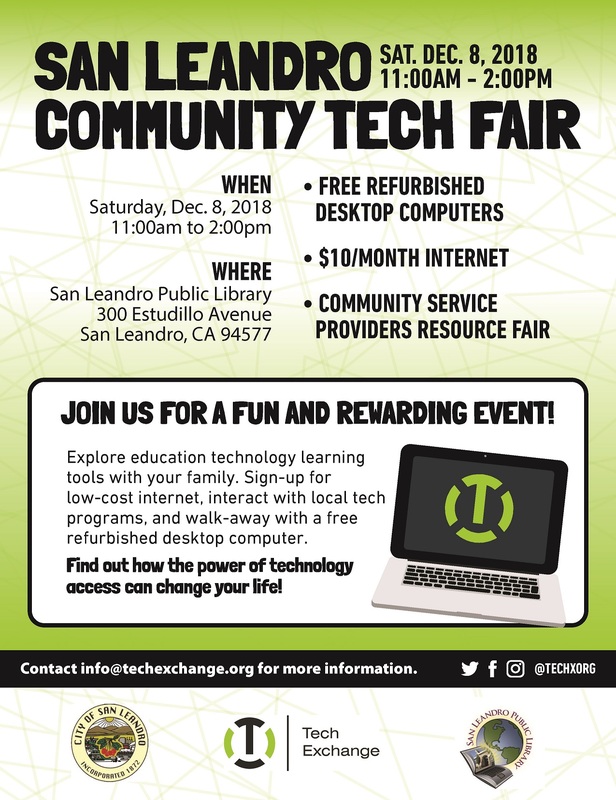 WHEN: December 8, 2018 from 11:00 a.m. to 2:00 p.m.
Tech Exchange will be providing free, refurbished computers to eligible participants that are: a) residents of San Leandro, and b) current participants of local social service programs such as CalFresh and discounted lunch programs at the San Leandro Unified School District (SLUSD). Tech Exchange will offer computer equipment while supplies last, and rain checks will be issued and honored. Tech Exchange will also assist residents with signing up for low cost, $10/month high speed residential Internet service. The San Leandro Library’s Appy Hour will offer experiential booths for the public to engage in the technological innovations of local businesses such as CodeAtorium and 3D Printer Universe. Library booths will offer the public demonstrations on accessing items from its collection of free downloadable e-books, audiobooks, and e-magazines. Literacy training on the use of E-learning portals Lynda.com, Universal Class, Tutor.com, and ABC Mouse at Appy Hour will assist with the reaching of educational, career, and personal growth goals. The Tech Fair and Appy Hour is a free event for the public. Light refreshments will be served.